We have had a great month doing almost absolutely nothing. What a nice change and a great opportunity to regroup after being on the run really since the beginning of last October when we left Kalumburu and made our way to One Arm Point for a short stint and then back off to Qld via Adelaide, Melbourne, Sydney and Brisbane. As always our trip back to the east was brilliant but very much full on. A bit of down time has been much awaited and we are slowly catching up on all sorts of little jobs. We left Kununurra with dry canvas and the sun shining. It is only 190 kms to Warmun, straight down the Great Northern Highway, heading towards Broome. We arrived just after lunch and were instantly impressed with the very tidy, rubbish free community. We made our way to the Clinic and to our new house. I was told before coming here that the housing was very nice, but we didn't expect it to be as good as it is. From the outside it looks like a huge green tin shed with a fully fenced yard right next to the clinic and the school. The yard was a bit of a disaster as there has been a string of short term relievers over the past few months who were clearly not into gardening. The house is very large and very modern. Three bedrooms, two bathrooms, a huge dining and family room and a lounge. Chris is especially impressed with the huge kitchen and massive walk-in pantry - which is as big as a bedroom! The house is very well furnished and very well equipped, including two TV's which has been great with the Winter Olympics on. I think this is the best shack we have had yet, while Harry is sure Kalumburu is still the best. New Lounge arrives. New lounge and a new phone. Our only complaint was that the lounge suite was a bit average, so a new lounge was ordered straight away and was here in the house within days. This Government Dept. really does know how to look after their staff. 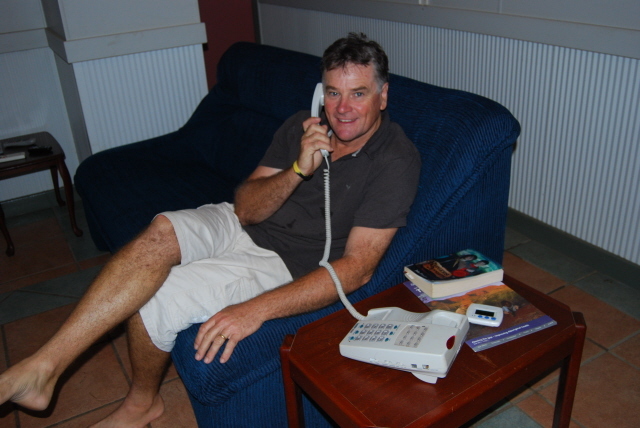 The only other issue was that we didn't have a dedicated phone landline. We were able to use one of the clinic's lines in the house but had nothing after hours and no STD. This was not a huge issue as we do have excellent Next G reception, but we really needed a phone for the boy's phone lessons. 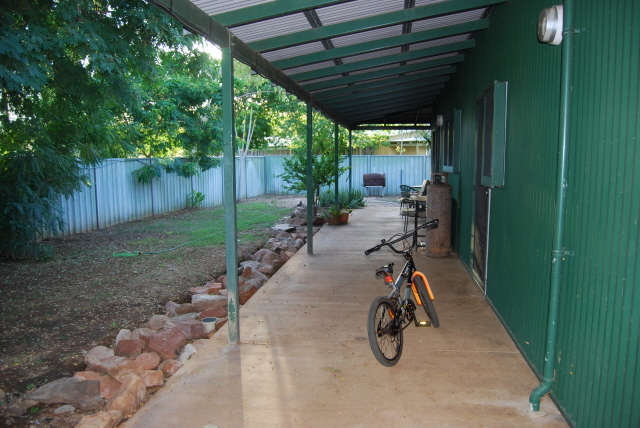 I mentioned it to the boss in Broome and was told to get it on and they would pay for the connection and the monthly rental, just leaving us to pay the calls. Gotta be happy with that as the boys phone lessons are free calls and we can ring people during our free chat on the mobile. Once again another example of how well they look after their staff. Yes, that handsome young chap is me!! We spent the remainder of Friday going through the house, chucking out bits and pieces and generally giving it a spring clean. On the weekend Chris continued in the house and I worked in the yard getting it tidied up and creating a mountain of rubbish to take to the dump. By the end of the weekend everything was finished, house clean, our boxes unpacked and the yard tidied. Eight weeks here before heading off to Vietnam. 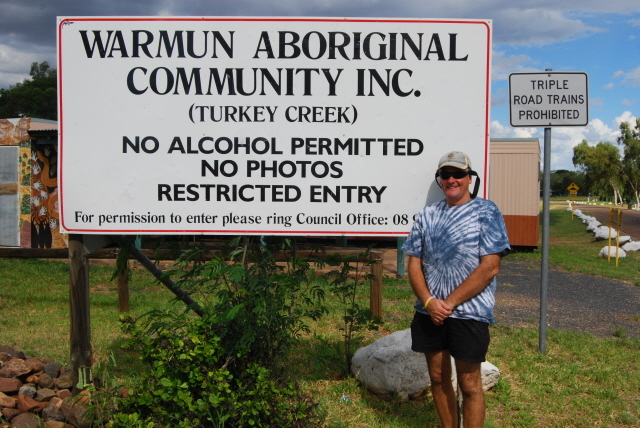 So what about Warmun, also known as Turkey Creek. 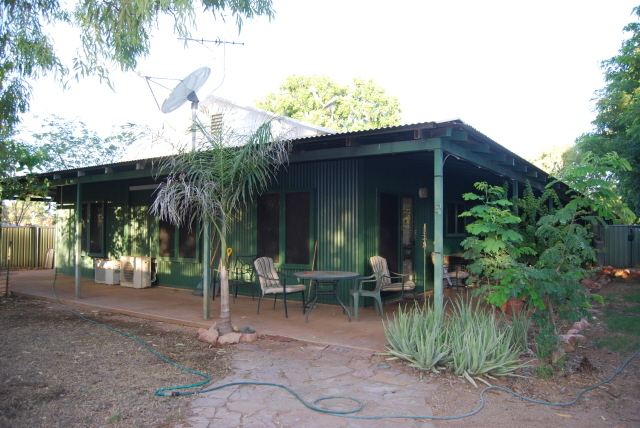 It is a highway community with somewhere around 400- 500 people, although most often a lot less as it is so close to Kununurra and Halls Creek. It is the closest place to the Bungle Bungles, with the turnoff only 50kms up the road. There is a roadhouse, a community store, a workshop with mechanic (called Chooky!! 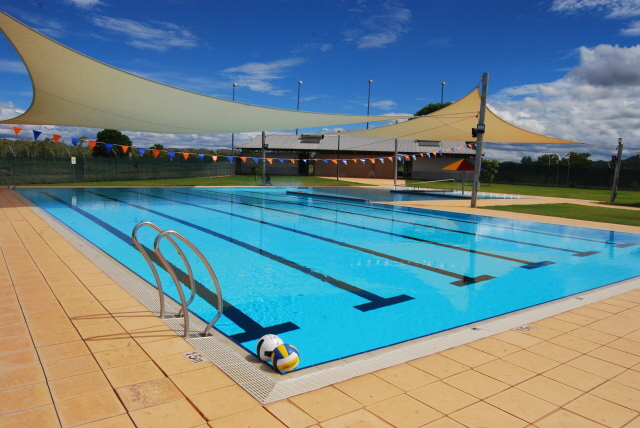 ), a catholic school, a police station, an aged care facility, a child care centre, a telecentre (not sure who uses it) and the best of all, a new 25 metre pool. The pool only opened a year or two ago and is as flash as. It is open 6 days a week and is free to community residents. 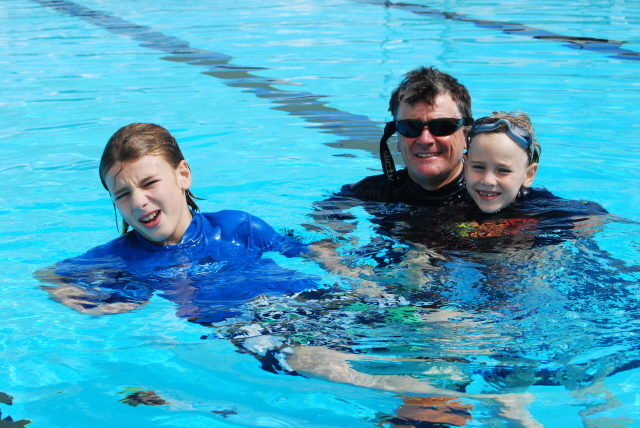 It has marked swimming lanes and Chris and the boys are there daily, doing their laps. 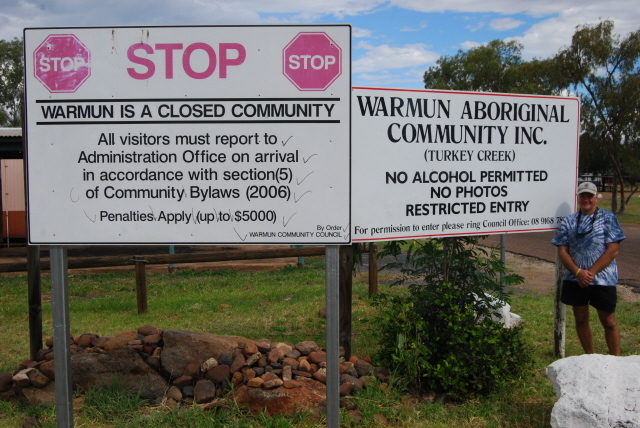 Warmun is a 'Dry Community' but is far from it in reality, although the police do try their hardest. 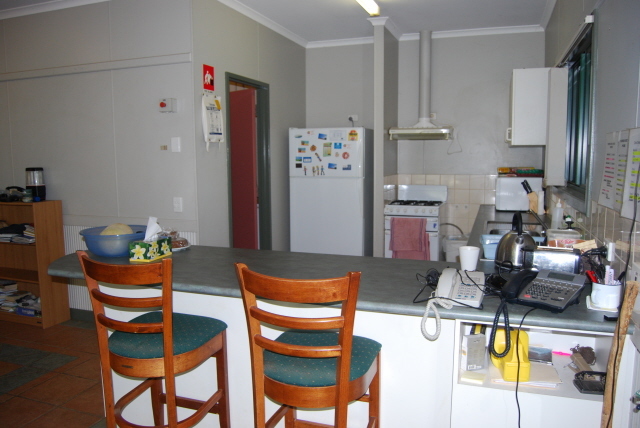 The local housing is of a high standard and the place is very clean. There is also a new and very flash arts centre that is open to the general public. It only sells local art that is very unique to this area (very bungle bungle) and painted using only natural paints (ochres mixed with glue) and no acrylics. It creates a thick lumpy finish that gives a very unique look. This is the only place that we have seen that actually uses natural paints. The art at the centre is expensive and it seems it is the only place you can get any paintings. Understandably the local artists are very loyal to the centre. In the tourist season, hundreds of people a day flock through the place. The locals seem like a nice bunch and are very considerate. There is very little humbug after hours and on weekends. 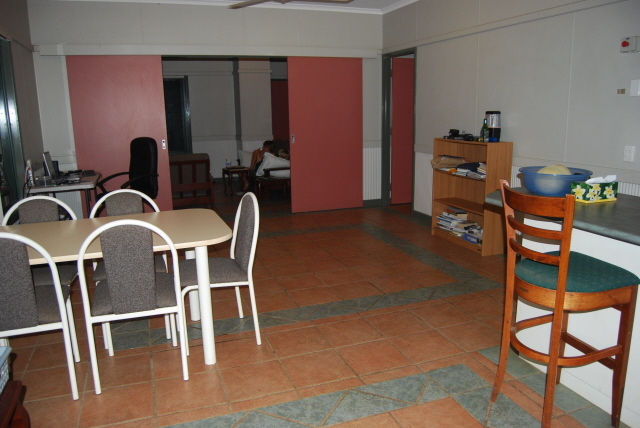 The clinic has two other white staff, an aboriginal health worker and a cleaner/gardener. The work during the day is steady and as I have said, after hours very quiet. There are two staff on call everyday (not really sure why) which means you only get one weekend off call every three weeks. I have settled into work well and Chris has picked up the equivalent of one day a week spread over a few days at the local catholic school, plus a bit of relief work. We don't want too much work as the boys really need to get stuck into their school work, as we will be away for a month in Vietnam when none will get done. As always the boys are happy doing whatever. Although they haven't actually gone to school here, the kids already know a lot of the local kids - from the pool or playing basketball with them after school. They are a friendly mob. In our first week here we had good daily storms and a bit of rain. Since then it has been clear and dry, as it has been throughout the entire Kimberleys. I hope that is not the end of the 'wet season' as that would be very disappointing. The days are bloody hot, too hot unfortunately to get out and do too much . There are a million grasshoppers around which some say is the end of the wet, while the locals say 'der more rain cumin'. I hope they are right. We have done a bit of local exploring but a lot of the places are difficult to access at the moment due to the wet. We attempted to visit 'Fish Hole' which we couldn't find and Winapa Springs which we found but was so overgrown we were unable to walk the last 100 metres, so will have to do it later in the season after it's been burnt. We have had a couple of social outings in our short time here. The other night we went to a teacher's "Mexican" night which was nice. 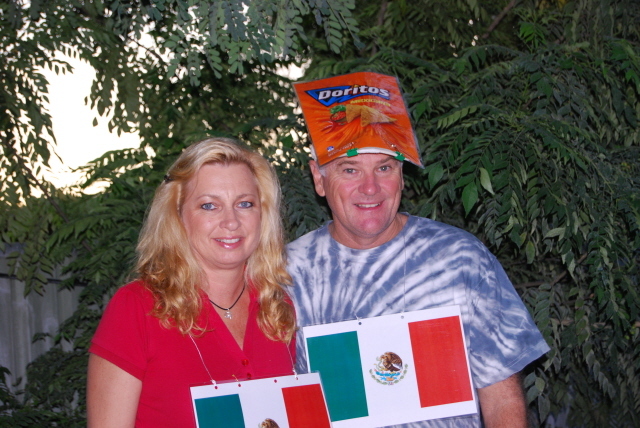 You were meant to come in fancy dress but all we could come up with was the mexican flag around our necks and I found an old corn chip packet that I laminated and stuck on my head. I am not sure if that actually passes as fancy dress but as we didn't have enough tea towels to cut a hole in and stick our heads through, so it had to do. There was a huge mob there and one of the teachers did all of the catering on her own. It was an amazing spread of food. It was also nice to meet a few more white fellas. They actually don't seem like a bad bunch, although you can be assured there will be an odd one there somewhere. In every remote place in this country there are always a few odd ones trying to escape from something. They do say there are three types of people who live remote: mad, missionary and mercenaries. We have added our own catorgory, menopausal. I am not sure exactly which one we are?? Well that's pretty much it. We have been here a month and have one month to go before heading to Darwin and then Vietnam. March will be much busier. 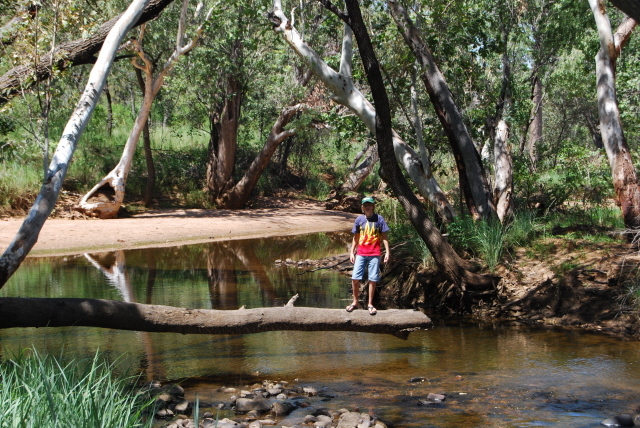 We head into Kununurra next weekend to do some more exploring and grocery shopping. The Health Dept. 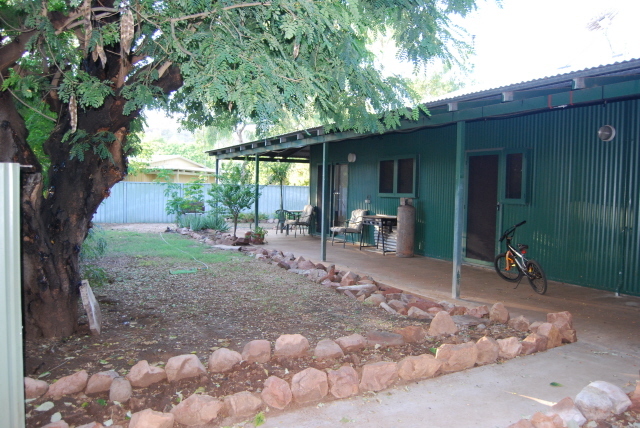 has a house in Kununurra that staff can use on their weekends off which will be nice as it is still hot, and will be much more comfortable than in the camper. Then we have Easter off and will spend the four days in the Bungle Bungles. The National Park only opens the day before (weather permitting) and we are looking forward to being there while there is still some water around. Our last visit back in 2006 was in July with the Joiners. By then it was fairly dry and very bloody cold. Easter should be much more pleasant. 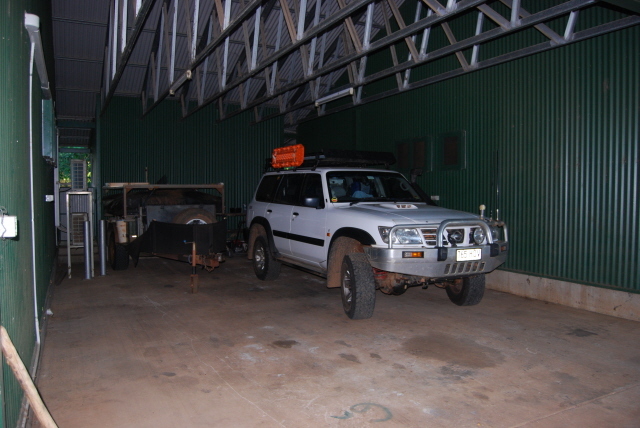 We then come back to Warmun for one night and then head to Darwin. 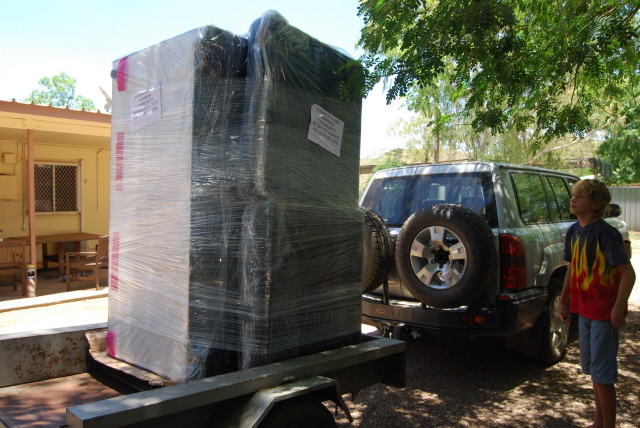 As we will be coming back to Warmun for a month after Vietnam before we head off to Cape York we will be able to leave most of our gear in the house and head to Darwin light. We will be leaving the car with the Murphys who are relocating from Yulara (he's the bloke in charge of the fire station at Yulara that we stay with) to Darwin and are leaving the camper at a friend of my mother's. All falling into place nicely. The only other thing of interest (at least for me) is that I have recently become an E-Bay junkie and have got all sorts of bargains that we absolutely needed!!! We also have just ordered a new laptop that we are eagerly awaiting. The Dell that we now have is over 5 years old and is still going as well as the day we bought it, (slow then and still slow now) and that's after being in the back of the car for the past 4 years, dare I say on some rather rough roads. I hope our new Dell is just as reliable. We bought pretty much 'top shelf' so it should be a bucket load faster and has a hard drive nearly 10 times bigger than our current one. What I find most interesting is that it's about $500-00 cheaper than what we paid for our old one, 5 years ago. That's good value. Oh and by the way, the locals were right, we did get more rain. 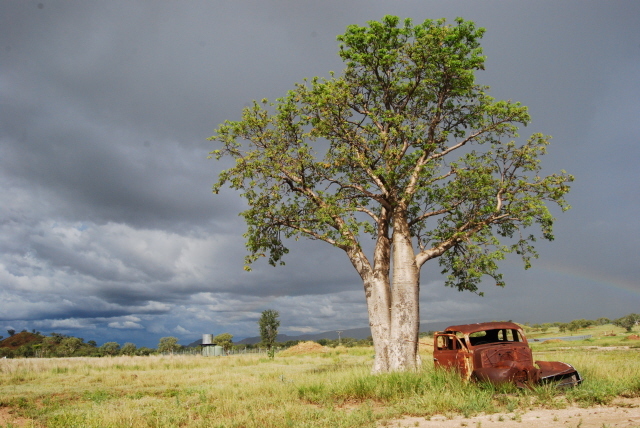 We just had about a week of great thunder storms as the monsoon passed over the top end of Australia. Boy can it rain, but now the skies are clear again. Well that's all from us. A slightly busier month ahead. Catch you then.